Improvement in care for patients with cardiovascular disease is one of the great medical success stories of the 20th century, complementing great strides in public health. We owe this triumph of medicine to the interdisciplinary efforts at enhancement to the technology of care (from devices to drugs to surgical technique), evidence from clinical trials, and dissemination of best practice and lifestyle improvements via education programs. Not any longer, and because of that survival rates are far higher than they used to be. Ditto for infant mortality, which this post reminded me of. A couple of years ago I posted a copy of the hospital bill for my delivery in 1958, which came to about $1,000 in inflation-adjusted dollars. But as my mother reminded me, that’s because the hospital didn’t do much of anything back then. When she arrived, they put her in a room that had….a bed, a bedside table, and a telephone. That’s it. In the delivery room, there was….a bed and a doctor. No epidurals, no beeping machines, no phalanx of specialists, and no real-time monitoring of every vital sign known to man. Today an ordinary, uncomplicated delivery costs upwards of $10,000. Is that worth it? 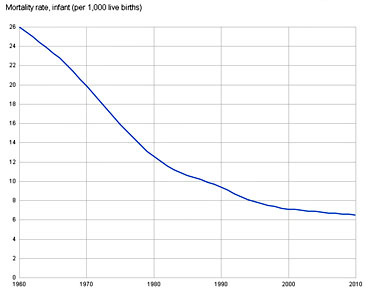 Well, as the chart above shows, infant mortality in the United States has dropped from 26 per thousand to about 6 per thousand over the past 50 years. There are multiple reasons for this, but all that technology is one of them. We spend a lot of unnecessary money in our healthcare system, and we tend to (rightly) focus a lot of attention on that. But we also spend a lot of pretty valuable money. That fact that newborns and heart attack patients are both a lot less likely to die these days is pretty good evidence of that.